For this card we used Kraft Cardstock as our base. 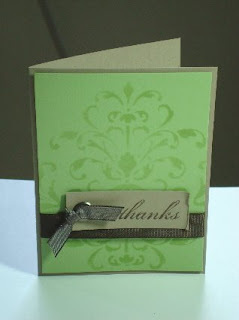 The Kind Thoughts Brocade Stencil was done in Certainly Celery Ink onto Certainly Celery Cardstock. 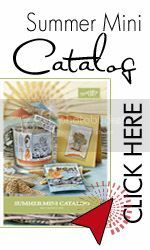 All I did was place the stencil over my cardstock and while holding it down, I used a Stampin' Sponge to sponge Certainly Celery over the stencil. Every now and then I would lift small sections of the stencil to make sure I was covering all the areas and the shading I wanted was right. I then stamped the "Thanks" sentiment from the Set using Chocolate Chip Ink onto a strip of Kraft Cardstock. I then punched a hole using my Crop-A-Dile and attached an Antique Brass Jumbo Eyelet to the Kraft strip. Then I tied Chocolate Chip Taffeta Ribbon through the eyelet. Before attaching this to the card I tied some Chocolate Chip Grosgrain Ribbon around the Certainly Celery Layer and then attached this to the Kraft Cardstock. 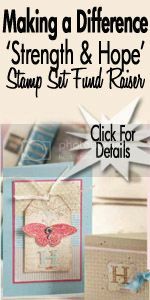 The sentiment is adhered using Stampin' Dimensionals. Very fast and very beautiful! Hope you like it, I know I do! That's all for today. I hope you have a wonderful Friday. 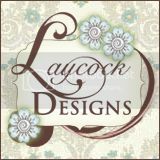 Tomorrow I'll be sharing the final project we made, till then Happy Stampin'!